Gary Paulson once again takes readers into his spellbinding experiences of the natural world. 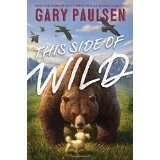 His newest book, This Side of Wild, focuses mainly on his many experiences with dogs, and occasionally birds. Are we training them or are they training us? Are you sure? After writing over 200 books for children and young people, he still has fresh insight into where he has been and what he has learned. His smooth, elegant writing style and down home good humor make this an enjoyable read for all ages. He takes us along on adventures of his past with some repetition, then explains what he means about who is doing the training with such explicit details as to allow us to watch our own dog a little closer. We will also take a more serious note of that birdfeeder out back and the ruckus we used to think pointless. Teachers and librarians can use this as an introductory book for reluctant readers who may not have met Gary Paulson yet. It is shorter than many of his, but quickly engages the reader. Especially if the reader is very interested in the outdoors and/or dogs. Literacy skills within the core curriculum standards are definitely strengthen and fulfilled as are science and geography standards at the middle grade level. Students could use a map of the United States to track the adventures in this book between Minnesota, Alaska and the Pacific Ocean. Various lifestyles, climates and wildlife patterns are explained. Parents might wish to use the book as an evening read aloud, or for the enjoyable activity of you read a page, and I’ll read a page. It isn’t just for reluctant readers, folks, it is a fun evening project for everyone.